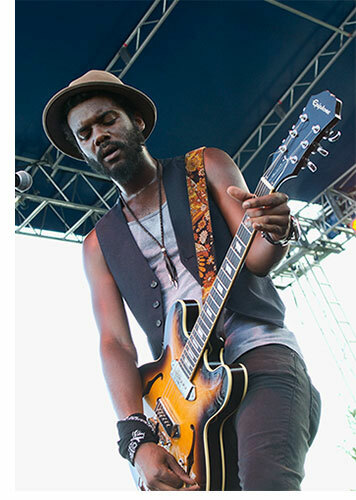 An Interview With Gary Clark Jr.
Last week during the annual Crossroads Music Festival held at Madison Square Garden, Austin native and rising star Gary Clark Jr. stood out among a dozen of rock's greatest guitarists as the man of the moment. He was neither the fastest or loudest or most technically challenging player of the festival but he effortlessly made the greatest impact. Clark brought ineffable presence--excitement--and star-power to the stage. Clark's performances were clearly anticipated by the crowd. Organizer Eric Clapton has never shied away from praising unique talent and his endorsement of Clark over the last few years (along with a guest slot and standing ovations backstage from The Rolling Stones) has only added to the seemingly unstoppable momentum of Clark's career. On the first night of Crossroads, Clark played his trademark Cherry Casino as well as his Epiphone Dobro Hound Dog. 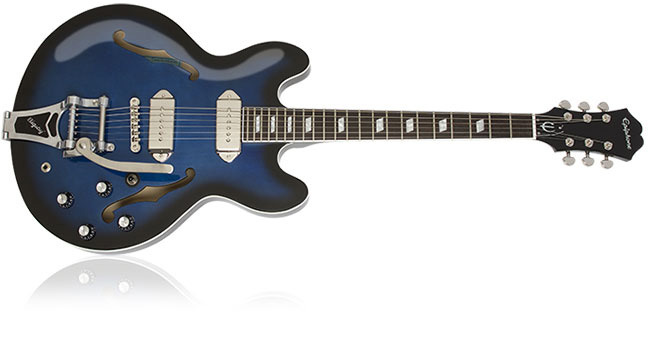 But on Saturday night, Clark followed Keb' Mo' and Taj Mahal (who brought the sold out crowd to a hush with versions of Son House's "Walking Blues" and "Diving Duck Blues"), and debuted a beautiful new Blueburst Casino custom-made by Epiphone in honor of his new album, Blak and Blu. In Clark's hands, the Casino threw out a howling tone unlike anything heard all evening. And unlike most of the superstars on stage, Clark dared to let his axe lead the way, conjuring feedback that shape-shifted throughout his songs, sometimes inspiring Clark to change his phrasing, relax the tempo, or drive harder. In comparison, Clapton and even Vince Gill seem a tad conservative. Clark was willing to let go, willing to take chances, and the audience instantly tuned in. When you see Clark live, you immediately get the feeling that he's just as surprised at what's happening on stage as the audience. Clark, age 29, began performing as a teenager in Austin, Texas and quickly got the attention of Clifford Antone, owner of Austin's beloved Antone's club who also famously helped Jimmie and Stevie Ray Vaughan begin their professional careers. With help from Clifford and enthusiasm from Jimmie Vaughan and many others, Clark (who is self-taught) worked on his chops, paid his dues in clubs, radio shows, and tours, and within 10 years was asked to perform his first Crossroads Guitar Festival. Since signing to Warner Brothers, Clark's presence in mainstream media has been steadily rising with performances at Bonnaroo, the White House, a South American tour with Clapton, and several guest appearances with The Rolling Stones on their 50th anniversary tour. All of that comes with a lot of pressure. As he told Consequences of Sound, he's not a musical ambassador. "I'm a lover of music. People have said things like 'savior of the blues' and blah blah and this and that. That's sweet and it's nice, but that's a lot of pressure for one dude." Epiphone.com spoke with Gary about his new home in New York City, his influences, sharing the stage with The Stones, and what's next. The beginning of the year. I thought I'd change up scenery a bit. It's busy, here. A lot of new sights and sounds for sure. Some quite annoying at times (laughs). But I like it. I like a lot. You've played Crossroads before. Does a festival like this require a lot of preparation for you and your band? To some extent yes. There's a little bit of soundcheck and rehearsals. I'm pretty sure the pros are not going to be rehearsing as much. But I'm trying to bring my "A" game for this one. Thanks for all your support, by the way. You guys have been wonderful. You're welcome! It seems like audiences everywhere are really responding to your style. I know you've talked about Magic Sam and Otis Rush as being influences. Those are artists that I would guess some fans aren't that familiar with. Yeah, you're right. I think the audience picks up on that. That's an interesting point (laughs). I'll have to think about it. I think we're differently bringing something a little different when we play. That might perk their ears up a bit. I think that's maybe what you're seeing. I spent a lot of time listening to Otis Rush along with Leadbelly and Robert Johnson. There's a lot of rhythm in their style. But I don’t think about it too much. If I did, I'd probably start freaking out and just freeze. Congratulations on sweeping the Austin Music Awards. Yeah, I got shown a lot of love that night in town. I haven't spent a lot of time in Austin lately, just because I'm living in New York now. Every time I go back, I notice it's changed. Different venues. Different names on the door. But the musicians who made it vibrant are still there. Still kicking it. You and (blues guitarist) Eve Monsees were neighbors when you both started visiting clubs together, is that right? I was about 14 or 15 when I started out playing in the clubs. I had been playing for a couple of years. They let us up because we were young kids. Our skill level wasn't quite where it needed to be. But they were so generous. I'll admit that. Those were good times. The thing that I noticed that's changed is the guys who kind of brought me up are gone away so that's a little rough to deal with. When you think back on it now, what do you think they heard in you? I think they were drawn to the fact that there was a young guy and a young girl just enthusiastic about the blues. I think those older blues guys were wondering: what's gonna happen after this? Where's this music gonna go? I think that they were inspired by wide-eyed, eager kids who wanted to hang with them, you know? Was there an artist during that time that you were really drawn to for inspiration? A vibe that really caught me was Albert King's thing. Things like Born Under A Bad Sign, Cold Feet, stuff like that. That whole groove and the intensity behind that. You know, his bends, his delivery. I was really drawn towards that. Other styles and things that made me think outside the box were Cody Chesnutt and Shuggie Otis--a combo of those three guys helped me become comfortable with myself. 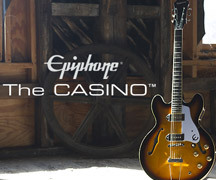 How did the Epiphone Casino become your main instrument? 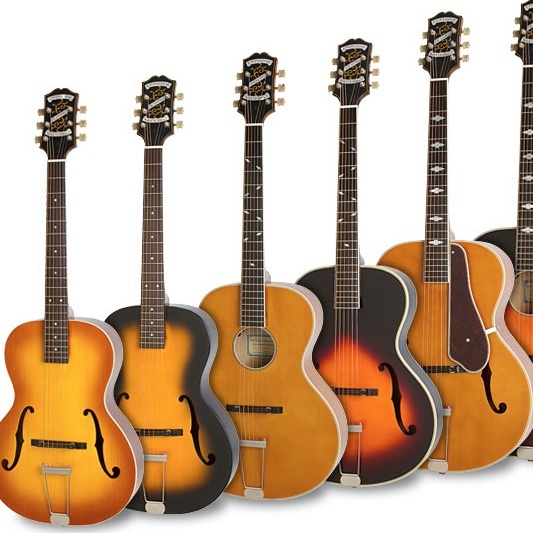 At first, the Gibson ES-125 kind of changed my world as far as introducing me to the hollowbody sound. And then from there, I had my eyeballs on Casinos for a while until I finally got one. I just recently got two "Blak and Blu" Casinos which I'm so stuck on at the moment. They're all so amazing. 'Blak and Blu' with a Bigsby! They're a dream. How has it been for you on a major label after working independently for so long? It's been a lot easier than I thought it was going to be, I can tell you that. They just let me do what I want and trust that I'm doing the right thing. They're cool. They're supportive. The thing that's interesting to me is there are a lot more people around with opinions. But that's something I expected and everything is running very well. And I like the people that I'm working with. It seems to be flowing. Are you working on new material for the next album? I'm not working towards a new record yet but definitely new ideas are floating around. Soundcheck is our time to experiment. I can speak for myself that I'm still excited about Blak and Blu's release. I'm still digging that--seeing new places. You'll be seeing the Rolling Stones again in London at Hyde Park this summer. Yeah, I heard something about that. As a guitarist, what's it like to be in the middle of Keith Richards and Ron Wood? Loud (laughs). It was cool. They're both great guitar players. The thing that's cool about them is their rhythm stuff is so amazing. I try to be respectful and remember the fact that I'm a guest and not get in the way. They're pretty welcoming so it's great. It went by so fast. I just tried hard not to mess up. I didn't soak it up as much as maybe I should have. Were you able to rehearse with them? Yeah, we rehearsed. That's where I found a way to be comfortable with them. But we both love the same music. We communicate. 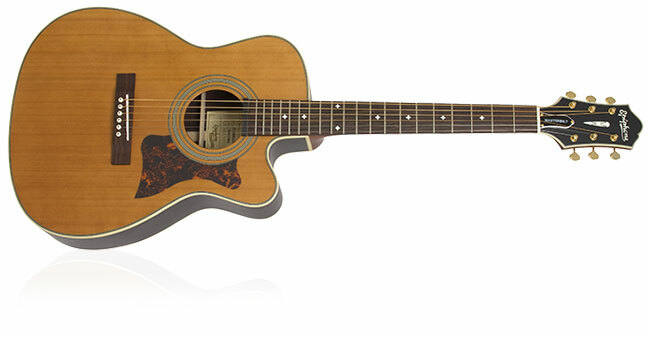 Are you still playing your Masterbilt EF-500RCCE on stage as your main acoustic guitar? 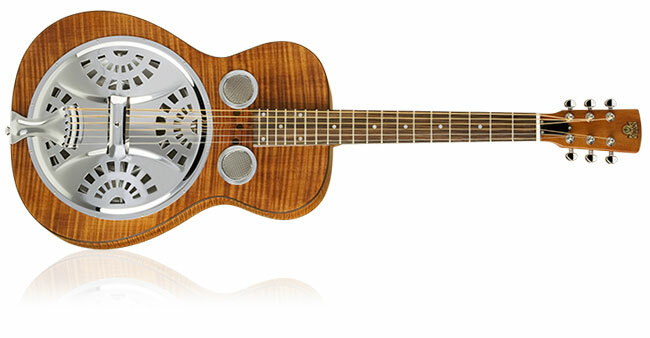 I am actually I'm playing the Dobro Hound Dog, too. I played it in London and that was really cool. You know you guys have been so generous. I'm just in awe over these guitars and I'm playing them, putting them on stands and chairs and just looking at them. Thanks for everything. I hope we see you down in Nashville soon. 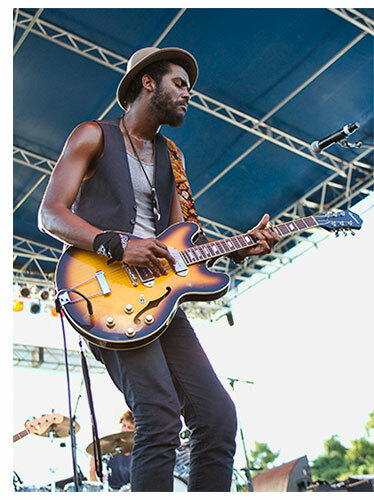 Check Out Gary Clark Jr.'s New Video "Numb"